DANGER – SHARKS EAT TOURISTS! 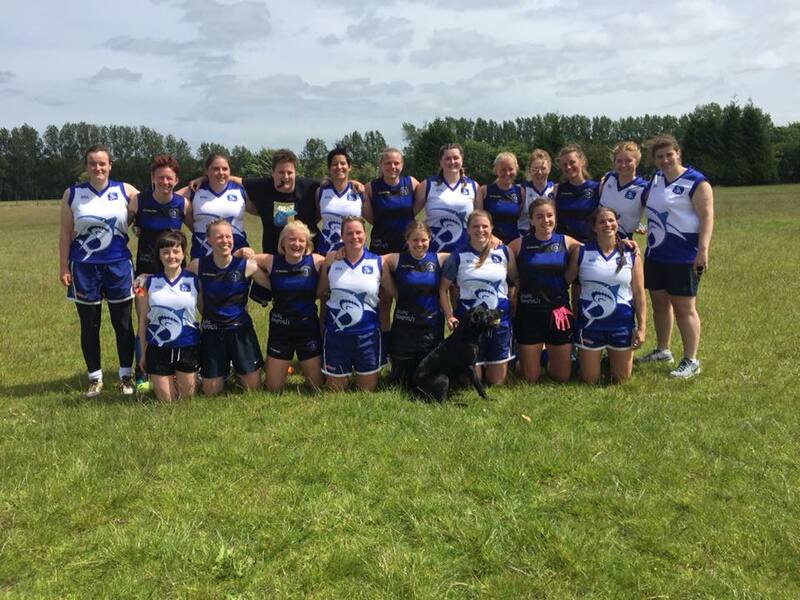 Back to back Saturdays at Braidholm (June 16th and June 23rd) saw the Tyne Tees Tigers travel up from the North East of England to take on the top of the table Glasgow Sharks men’s team while the Port Malmo Lynx boarded their longboats and sailed west to face the women’s team. After a prolonged spell of good weather not seen in Scotland ever, both teams were in good spirits as they arrived at the ground, the travelling side coming by coach and in good numbers. Any hopes of playing for a second week in a row with a dry ball was short lived however as 15 minutes before ball up the rain arrived, and brought it’s pals thunder and lightning with it. The game began a soggy affair with both sides struggling for clean possession out of the middle. From the word go it was clear that both teams were playing for keeps and had physicality in their game plans with big bumps and heavy tackles being laid in an effort to gain an edge. This struggle didn’t make for much free flowing footy and goals were somewhat scrappy and opportune until the end of the first half with the Sharks winning the majority of the up and over from the ruck and the in and under from the contest. The second half saw the clouds part, the wind pick up and the ball get stickier letting an overall higher quality of football break out. Where marks were being spilled in the first half due to the greasy pill, now they were being taken and targets hit. This was most notable in the forward line where Liam Dolling was coming more and more into the game. The Sharks top goal scorer didn’t have it all his own way, a persistent and tactically aware Tyne Tees full back keeping the young forward honest throughout. Every goal scoring opportunity having to be earned in his toughest test of the season so far. With the ramifications of victory being a guaranteed entry into the finals series, the Sharks were able to maintain the pressure and intensity which has seen them overcome every team in the competition thus far. Slick interchanges to rest fatigued players and replacements being of equal quality meant no rest for the Tigers who had suffered a few knocks to key players throughout the 80 minutes. Locking the door and throwing away the key in defence saw the Tigers add little to the scoreboard in the second half and accurate kicking from the home side attack kept the blue numbers ticking over steadily. This was no picnic as the physical nature of the game and effort to the end from the Tigers meant that the league leaders knew this was a win they had had to take rather than be given it, the final score gave no comment on the efforts of the visiting team. 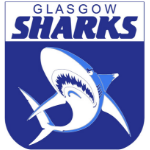 Having avoided each other at major tournaments the Port Malmo Lynx accepted the Glasgow Sharks invitation for a women’s match to test each other and keep skills sharp as international season approaches. The Lynx, who make up the majority of the Swedish National Team, travelled in fantastic numbers even bringing with them some supporters and cheerleaders to campaign for the cause. 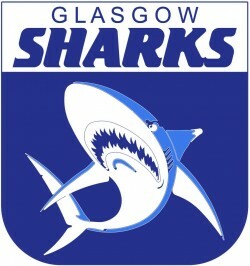 Showing the strength of the ladies’ game in Scotland, the Sharks fielded a team of 11 with the contest being played 7 a side over 4 x 12-minute quarters. Impressive roving from super troupers Orfhlaith McCaughey, Jen Treacy and Caroline Sellar kept the midfield ticking over with (ironically Scandinavian) reliability and showed that desire for the footy is the name of the game. Quick handballs in tight spaces created gaps in the midfield which were exploited to great effect. Strong lead up play and soft hands in the forward third left the scorekeeper without a minute to himself all day. A second quarter overhead snap earning captain Stacey Hughes first prize in the Eurovision Goal of the Day Contest. In defence the Sharks began resolute and steadfast, locking down and protecting key areas to thwart the fresh legged Swedes. Carolyn Baker and Ellie Sutherland delighted in clearing all but the most dangerous of attacks as the Lynx struggled to get a solid foothold in the game, their periods of possession coming in areas where they were unable to affect the scoreboard impactfully. As the game grew so did confidence with defensive players and attacking players swapping roles freely with the fluidity of a side that had trained for years and played 100+ games together. This seamless cohesion seemed to come naturally for the group and was the most pleasing aspect of the performance according to coach Stephen Connor who also commented that the men’s team could learn some serious lessons in that regard. Noticeable throughout the entire game, even when under pressure from an undeterred Port Malmo team, was the communication of the home team. Minor scores, missed tackles and skill errors were met with encouragement and positivity from every player at every turn. The fruits of this often-overlooked aspect of the game were clear to see in the second and third efforts being put in by the players on the pitch. Another indicator that this team is considerably more seasoned than it appears on paper. Overall the Sharks skilled, accurate and savvy ball use coupled with tireless running and fierce tackling left the Lynx needing Fernando to send out an S.O.S on their behalf… Mamma Mia!